The timing is particularly poignant for me as my wife and I are setting out today for our third summer living our dream. It began in 2013 living and working in Yellowstone National Park. Following a fantastic experience there, the temptation was great to return there the next year, but our dream was to keep moving, exploring and discovering. Last summer was spent in Mount Rushmore National Memorial. This summer, we’re shuffling things a bit, working in a theme park in upstate New York. Many people – some old friends and a great number of tourists with whom we interact while on our adventures – have said something like, “I would love to do what you’re doing,” but we know most of us get too comfortable in the day-to-day to take a chance. And that’s not necessarily bad; it’s what many really want. We talked for some time about our dream and whether we could or should pursue it. Then, in the fall of 2011, I had a tumor successfully removed from my bladder and we took that as a sign to move forward. We drastically downsized our lifestyle, my wife retired from teaching as soon as she was eligible and we took a step off the cliff. 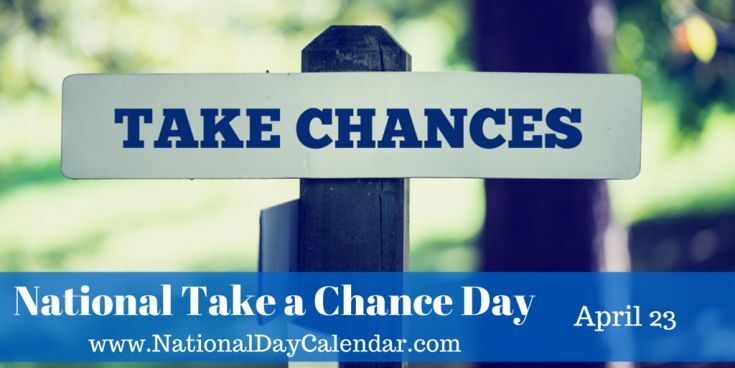 If you have a yearning to try a new career, to change what you’re doing with your life, to travel, to … whatever … what better time to start working on it than National Take a Chance Day? It doesn’t have to be put into effect today (though it could) but start planning. Set a deadline. Be sure and let us know what you want to do. I took a huge chance three and a half years ago when I quit my job as editorial director for an online company, where I had worked for 6 years to build my team from the ground up. In many ways it was my dream job, but it was past time for me to go. I left without another job to go to (although I fortunately found something very quickly), which was pretty scary considering I’ve worked almost non-stop since I was 16. But it paid off in ways I could never have dreamed of. Almost three months later we found out I needed to start preparing for my real dream job: Stay-at-home mom. I haven’t quite decided what my next jump will be when the kids are older, but a few ideas are starting to form already. Wow, that’s truly living the dream. I look forward to hearing about your next big move. Thanks for sharing.